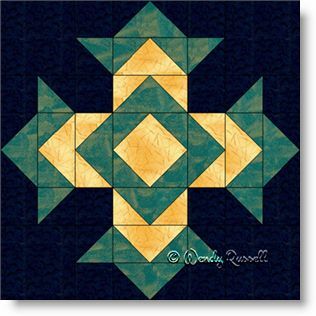 The God's Eye quilt block is an eight patch featuring lots of half square triangles and flying geese patches. This will be great practice for your sewing skills, as these two patches are the most commonly used pieced units in quiltmaking. To make the sewing of the block easier, I chose to construct it as an uneven nine patch, which in my view, is a simpler way to put the block together, rather than in eight rows. The two sample quilts illustrated are designed in standard quilt settings -- one on point and the other with blocks side by side. I noticed that you get a bit of a secondary pattern emerging (forming a sort of starburst shape in the background fabric) when you place the blocks next to each other. I love it when secondary patterns emerge unexpectedly!